It is finally the end, the end of the 2008 World Series of Poker Main Event and we have not only crowned this years World Series of Poker Champion, but we also have crowned the youngest player in history to win the World Series of Poker Main Event title. That is right Peter Eastgate has beaten Phil Hellmuths long standing record of being the youngest player to win the World Series of Poker Main Event. Peter Eastgate beat out Ivan Demidov whom most pros were picking to win it all due to his play during his time off from the final table and the will he imposed on opponents during the start of final table play on November Nine. And we have now got the November Champ!!! At the start of the heads up match between it seemed as if everything was going to go Ivan Demidovs way and Demidov even overcame a $23 million chip deficit to take a small chip lead for a short while. That’s right for a short while and then it was time for the Peter Eastgate show. There was some time where the chip stacks sort of hovered around each other closely but when Peter said it was enough, boy did he mean it. Peter was most of the match just chipping away at small pots taking a couple million here a couple million there until he would have a substantial chip lead, but then Ivan would climb his way back just a little bit until Peter would start chipping away at the small pots. The small pots eventually ended and the turning point in the match was when Peter Eastgate turned a flush against Ivan Demidov and ended up raking in a $44 million dollar pot. From then on Ivan would just get chipped away some more until the inevitable happened. Ivan Demidov moved all in. The final hand of the final table, of the heads up match, of the 2008 World Series of Poker happened like this. Ivan Demidov is the big blind which makes Peter Eastgate the button and with that Peter limps in on the button and Demidov decides to just check. The flop comes out 2(d)K(s)3(h). The decision is up to Demidov who decides to check it over to Eastgate who in return decides to bet $1.25 million, which Demidov decides to call. The turn brings the 4(c). Again Demidov checks it over to Eastgate who decides to bet $2 million, which this time Demidov puts in a raise to $6 million. With that raise Demidov has committed half his stack now into the pot and Eastgate decides to just call the raise. On the river comes the 7(s) and like clock work Demidov goes all-in and a snap call by Eastgate. Both players flip over their cards and Demidov shows 4(h)2(h) for a turned two pair. Its now up to Eastgate to flip his cards over and he shows A(d)5(s) for the turned wheel straight. 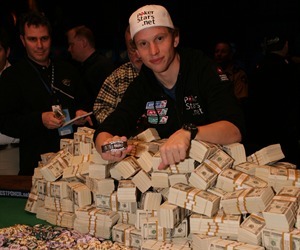 So its final Peter Eastgate is the new 2008 World Series of Poker Champion. For that Peter receives the coveted World Series of Poker Main Event bracelet and a cool $9.1 million dollars. But wait that is not it, Peter Eastgate also becomes the youngest player in World Series of Poker Main Event history, at 22 years of age, to win the tournament. Ivan Demidov takes home a nice paycheck as well which is $5.8 million. Congrats Peter Eastgate we look forward to hearing from you in the future. I was wondering, just how old is Eastgate ?